​​ COLLEGE STATION – The George hotel, named after George H.W. Bush and George Mitchell, will open August 2017 in the Century Square mixed-use development. 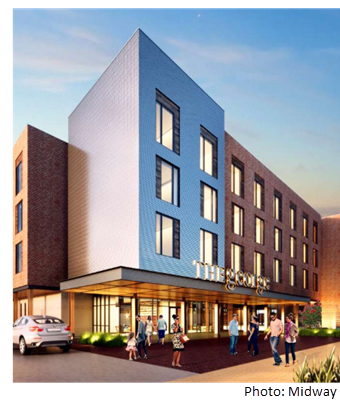 Houston-based Midway teamed up with Valencia Group on the 162-room hotel, which is being developed in partnership with the university. Cost of construction only is estimated at $19.5 million, according to TDLR​. The hotel has 5,800 sf of meeting space, a fitness center, courtyard with pool, and outdoor fire pits. Amenities include Poppy, a restaurant bearing the nickname given President George H. W. Bush by his grandchildren​. The 60-acre Century Square development, located across from Texas A&M's Bonfire Memorial and the School of Engineering, combines retail, dining and entertainment, offices and apartments and a central gathering space.